A Capricorn zodiac symbol tattoo can take many different forms. If the idea of having a goat tattoo doesn't appeal to you, there are other symbols associated with Capricorn that easily translate into a terrific looking tattoo. 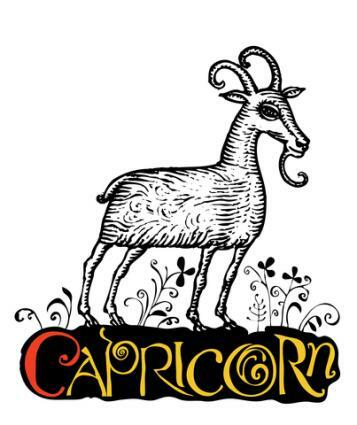 You are a Capricorn if your birth date falls within the time span of December 22nd to January 20th. 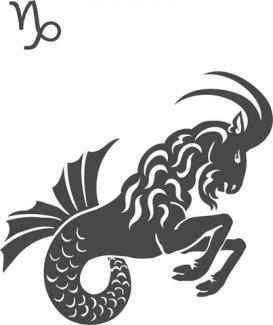 Capricorn is represented by a goat or sea goat. The sign's stone is the black onyx. Any of these aspects of the Capricorn can easily be incorporated into a tattoo design. Choose one or a combination of defining Capricorn characteristics to create a tattoo that presents the image you want to portray. The traditional symbol associated with this sun sign makes an outstanding tattoo. According to Babylonian tradition, Capricorn was actually an ancient god whose upper body was a goat and lower body was a fish. A half goat, half fish image would make an impressive tattoo by itself, but think about ways to enhance the design. Perhaps your Capricorn is lazing on the shore with his tail in the water, contemplating the stars in the sky that are named for him? Some cultures have simplified Capricorn to the figure a goat, so you can use this imagery in your tat if you're one of those Caps who prefer a more down to earth design as befitting your nature. Each astrological sign of the zodiac has an accompanying symbol or design. Instead of getting a tattoo of a goat on their bodies, many Capricorns choose to instead get a tattoo of the glyph for this sign. Another option for Capricorns is to get a tattoo that is indicative of the earth element. You might even choose a tattoo that combines the animal, glyph and earth element all together in one design. The planet of Saturn can be a beautiful image for a tattoo, and some people turn to this image instead of the aforementioned options. 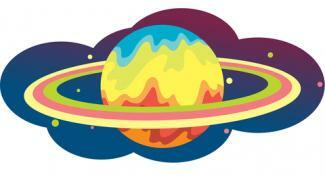 Saturn tattoo designs are varied and can be customized quite easily with regards to size and color. Perhaps you'll find more inspiration for your tattoo once you consider Capricornus, this astrological sign's constellation. The Greek mythology concerning Capricornus varies from the traditional goat/fish imagery, offering even more tattooing opportunities. According to Greek tradition, this constellation represents their demigod Pan, the offspring of the god Hermes and a woodland nymph. Pan had the upper torso of a man and the lower half of goat. He also had goat horns and played that funky pipe. Consider using a constellation tat that layers your stars over an outline of the goat-fish. If the Greek accounting appeals to you more, choose Pan as your muse and picture him looking up at the constellation from his forest home. Since this would need to be a larger and more detailed tat, your back would be a great location for it. Capricorn's star stone, connected to the planet Saturn, is the onyx, but its birthstone is the lovely diamond. One design idea for this angle would be layering the word "Capricorn" over a tat of one of these jewels. The colorful pansy: There's almost no limit to the number of shades and color combinations the cheerful pansy comes in. 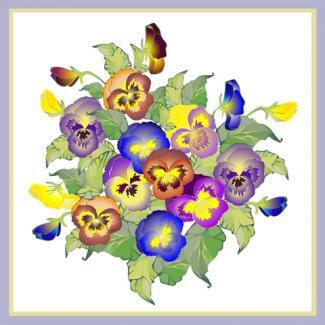 A small pansy bouquet tattoo would look particularly nice on either side of a woman's upper chest. The gorgeous amaranthus: This plant sends out intensely-colored floral spikes in shades of pink, fuchsia, red and purple. The spikes arch gracefully under their own weight. Imagine a field of amaranthus filling out a half sleeve tattoo. Very elegant indeed. The ever-popular ivy: Ivy tattoos can make terrific arm, wrist and ankle tattoos. Picture those triangular leaves set along trailing tendrils of greenery. Using multiple shades of green and some white ink accents gives this kind of tat extra dimension. There are so many options when it comes to Capricorn symbol tattoos. Narrow your search for the perfect design by figuring out which message you want to send. If you simply identify with the Capricorn sign and all it represents, a goat or glyph tattoo will be ideal. If you want to give a nod to your sign without making it the focal point, incorporate it as a detail in a larger design.